Tagline: Back on line, Back on duty. Back in 1987, actor Peter Weller worked miracles to help create one of science fiction‘s best-loved characters. This may seem like something of an overstatement considering he spent the majority of Robocop hidden behind bulky armour, but believe me, once you see another actor attempting to pull off the role of OCP’s most noble creation, you tend to acquire an increased appreciation for Weller’s most definitive mainstream performance. In hindsight, it’s astonishing just how much he was able to convey with little more than a taut mouth and prominent chin. Of course, none of this came easy. Peter Weller would find the role of Robocop rather stressful. First of all, Weller was far from director Verhoeven’s first choice to play his titular mandroid. Both Arnold Schwarzenegger and Rutger Hauer were considered for the role, but were passed upon due to fears that both would look too bulky stuffed into their laboriously fitted, oversized costume, and they weren’t wrong. Even Weller, slender and athletic in frame, struggled to squeeze into a suit which took an average of 10 hours to fit, and even after weeks of preparation mime training and dancing around in football equipment he struggled to move, a fact that resulted in the stiff and rigid motions that would come to define the character. 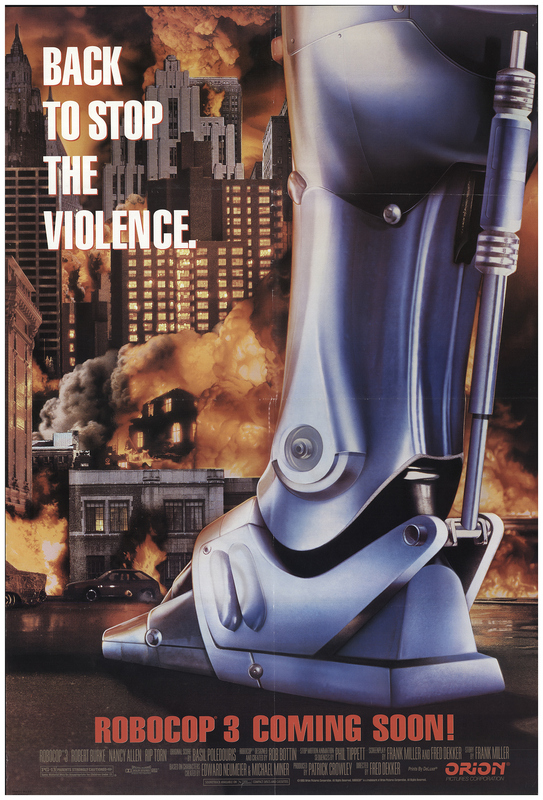 Three years later, Weller would return for Robocop 2, another ultra-violent satire. The first sequel may have lacked the charm of its predecessor, but still did more than enough to entertain, our leading man’s performance holding together an often screwy screenplay that saw him turn his back on the role when the opportunity for a third payday came calling. In his place, Orion cast relative unknown Robert John Burke as Robo. You may remember him as the eponymous Dust Devil in Hardware director Richard Stanley’s equally fascinating low-budget horror, or a TV stalwart who has appeared in shows such as Blue Bloods and The Sopranos, something that doesn’t happen accidentally. Nancy Allen thinks long and hard about her decision to sign up for the Robocop 3. Still, Burke is the movie’s main problem. This is not a dig at his acting ability — far from it — but the fact is some characters can only be portrayed by one actor. Once they try on the role, their DNA becomes intertwined, and it is impossible to separate the fantasy from the reality. This is especially true with Robocop due to the circumstances already mentioned. Many actors could have filled the role of Murphy, but the characteristics that define Robocop were the result of happenstance. It was the hindrances and restrictions that forced our protagonist’s personality, and for a character like Robo, movement is everything. Another thing lacking in Weller’s replacement is the angled features that proved crucial to his suitability for the role. It was the half man, half machine existing under the suit that gave previous instalments their emotional core. In spite of make-up’s best efforts in creating that look, Burke has a very smooth and rounded face which makes him look anything but robotic, while director Fred Dekker makes the wise if ineffective choice of keeping Robo’s facially exposed screen time to a minimum. Robo attempts to take a dump in peace. As for the plot, you won’t find too many surprises. Once again, Delta City is squirming under the rule of Omni Consumer Products. This time around, gentrification is the order of the day as the company and their new Japanese bosses look to run citizens out of their homes, turning the city into a commercial haven. In order to enforce their wishes, they have employed the help of a private army who think nothing of gunning down innocents in their pursuit of mindless tyranny. After having a customary pang of conscience, Robocop begins to defy orders and turns against his employers, a corrupt organisation who once again consider disabling their creation by overriding the part of his brain that makes him human (will they ever learn?). Thanks to the impossibly beautiful Dr. Marie Lazarus (Jill Hennessy), Robocop escapes nullification for a third time, joining an underground resistance as he seeks to put things right. This is much to the delight of a besotted little girl named Nikko, an orphan who inevitably triggers Robo’s familial memory bank, sending his emotions haywire. Resistance members get wrapped up in a staring contest. Inevitably, Robocop is framed for the murder of long-suffering partner, Lewis (Nancy Allen), and a whole lot more, becoming the subject of network propaganda so inept he is soon fingered for the slaughter of a church full of nuns, leading one anchorwomen to storm off the set in disgust. When that doesn’t work, the Japanese corporation at the root of all the evil sends a fleet of cybernetic ninja terminators to finish Robo off, a slew of gimmicky weapons attempting to disguise the movie’s lack of originality. As you can probably gather, it is all rather silly and repetitive, leading to a showdown of underwhelming proportions, and though this is the sequel that the consensus holds responsible for the death of the franchise (and Orion Pictures thereafter), you can’t help but buy into the abject silliness of a movie shot way back in January 1991, in spite of its endless flaws and refusal to adhere to the winning formula of previous instalments ― I mean, where are the Sunblock 5000 commercials and unrestrained violence that made the series so mindlessly enjoyable? Presumably on the cutting floor in favour of a toy range that would make it all worthwhile for impressionable tykes across America. A distressed Nikko attempts to save a hapless Robo from drowning. Ultimately, Robocop just isn’t the same without Weller. 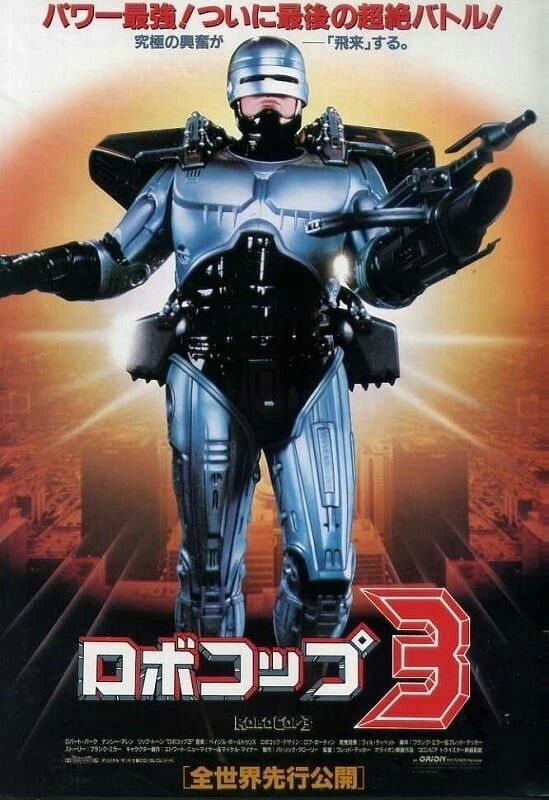 Robocop 3 was rushed into production, and when the actor turned down the role in favour of David Cronenberg’s William Burroughs adaptation, Naked Lunch, they quickly had to find a replacement. Due to budgetary restrictions, they were forced to go with an actor who could fit into the suit used in the previous movie, which is kind of a cop-out from the offset, but it’s not just a question of the movie’s physical aspects. Robocop also sounds different, feels different, and a largely questionable screenplay often leaves our hero looking weak or downright ridiculous. In fact, Robo is put out of commission as early as the first act, and again in the second act, while the inner turmoil that makes him such an emblematic creation is almost totally absent. During a showdown with a cybernetic ninja terminator, Robocop has his arm sliced off with a samurai sword. Miraculously, his automatic machine gun attachment still fits into place and he is able to blow the bad guy’s head clean off. In an excruciatingly melodramatic scene, Robo carries a dying Lewis through a church and rests her on the alter, where she relays to him her dying wish. I would tell you that the two then shared a moment, but that would be pushing it. Off the top of OCP’s towering HQ. After detonating their way into a police headquarters, members of the resistance come up against a once fearsome ED-209, a machine that gives its usual ‘stop or I’ll shoot’ spiel. Luckily for them, miniature tech whizz Nikko is able to plug her Atari keyboard into the robot’s mainframe, programming it to be as loyal as a puppy. ED-209: I am now authorised to… be loyal as a puppy. You almost want to reach out and pet him. 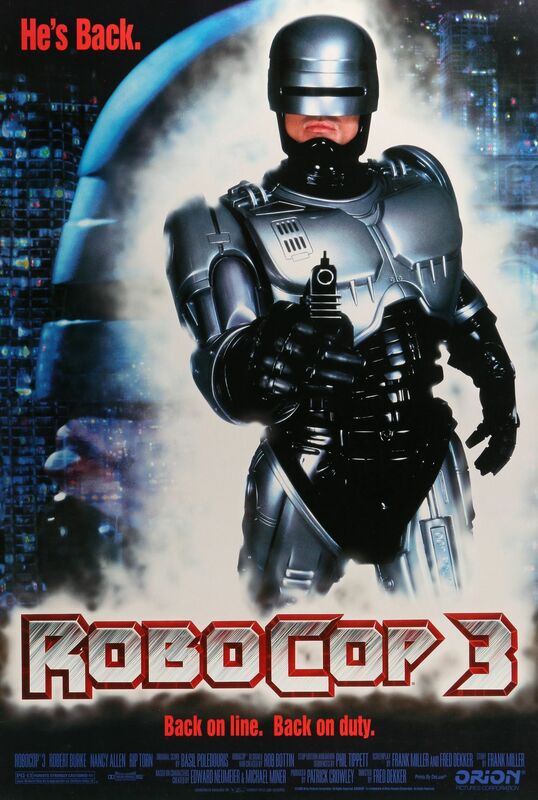 Robocop 3 manages to omit just about everything that made the original instalment so special, featuring cardboard delineations and a speculative dystopia which lacks insight or imagination. Add to this a minuscule budget and the absence of Peter Weller and you’re fighting a losing battle, though the concept of cybernetic ninja terminators is almost worth the price of admission.